Well ladies and gents, Tuesday, 9th of March 2010 was an adventure! Many of you know that John Rodkey of the "fearless Aeronca Aviators" email list (fAA) flew from Santa Barbara to the Cactus Fly-in held every March in Casa Grande Arizona. He was in his Aeronca Chief, nicknamed "Tacky" that he had just finished a three year complete ground up restoration in several months ago. Weather was a bit difficult on Saturday and became worse on Sunday, with high winds and rain coming in from the West. Guess which direction John needed to fly? He took off on Sunday and headed home. Got as far as Buckeye (aka the Western part of Phoenix) and decided to wait it out overnight. Took off on Monday heading West. 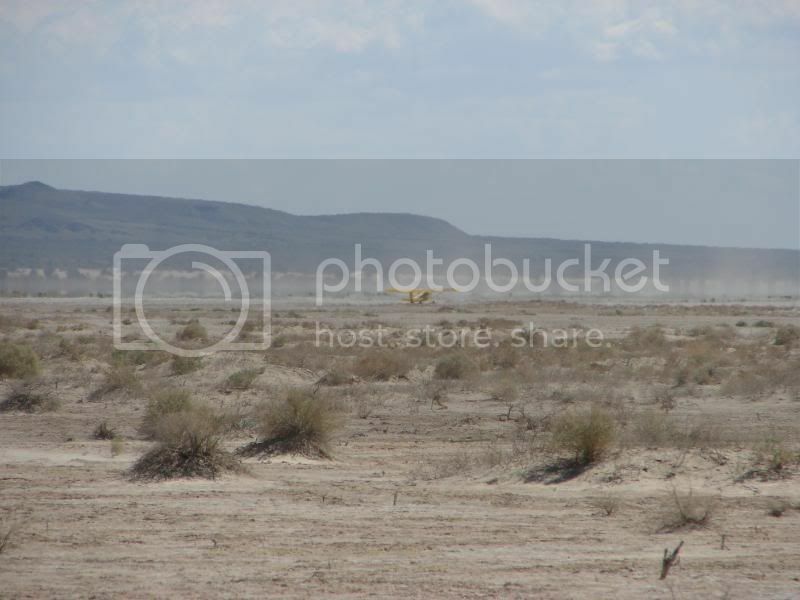 He made it to the Blythe California area where the weather started getting difficult, with rain and clouds everywhere. Tried to make it to the North to get around mountains and restricted areas but could not so he circled down South intending to land at Desert Center, a "hole in the wall" airport with no services but at least a reasonable runway and place to wait out the rain. 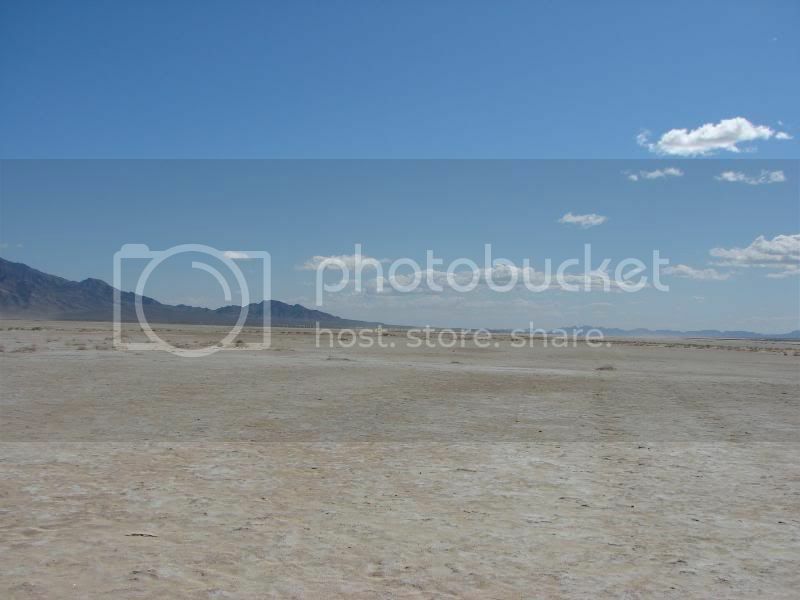 As he was heading that direction he noticed a playa ahead, one of the many so called "dry lakes" in this area. They are dry 99% of the time. Unfortunately they are NOT dry after a heavy rain and John did not know that it had been raining for days, if not weeks in this area. He landed and did the right thing in holding the stick full back and doing a three point stall landing. 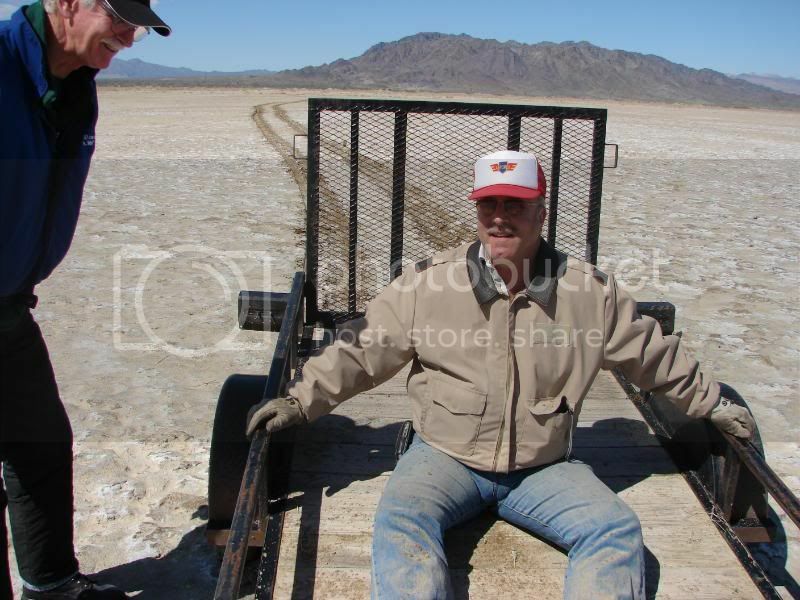 Once he touched down he realized that the "dry lake" was not very dry that day and the airplane soon sunk down into the mud to its axles on the main and the tailwheel (a small hard version) was well below the surface. It was almost to the base of the rudder in the back. He waited the rain out then tried to get the airplane out but there was no way this was going to happen, especially with his being alone and in these conditions. Luckily for him his daughter was driving from Tucson back home, so he called her and she headed in his direction. He then began the 3-4 mile walk out to the closest road and the long drive home. No way to tie the airplane down, he turned the tail into the wind and left it there. Re: How three of us spent our Tuesday or "The rescue of Tacky"
We started making plans to head to Desert Center. 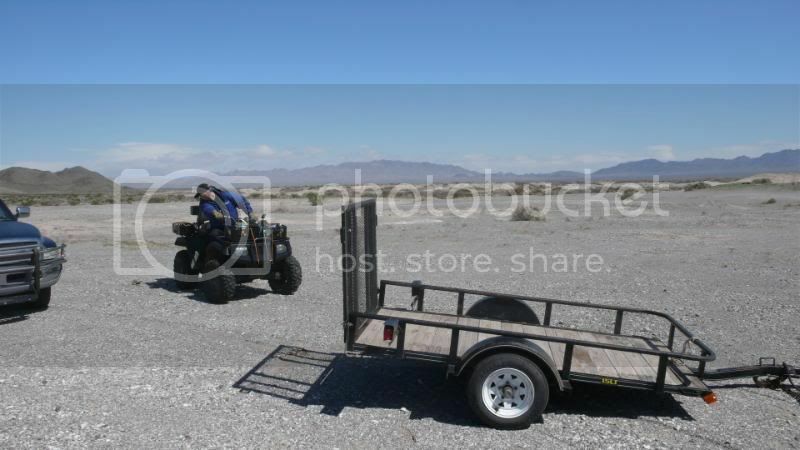 Called in a few favors and a friend loaned us his 4 wheel drive ATV and trailer for the day. Contacted John and told him “do not tell me or contact me in any way if the FAA or Sheriff says you have to trailer the plane out” as I was concerned about getting it out right now before something bad happened to the plane. This is a big area for off roaders and we found tracks everywhere in this area, so it would have only been a matter of time before someone else found the plane. Not sure what they would have done to it nor how it would do not being tied down out there with several storm fronts coming through, so it was important IMHO to get it out of there NOW. John let me know that the FAA and Sheriff said that they would not be very excited about our flying another airplane in to pickup the Chief, but driving there and flying it out was ok on their end, so we started to exchange info later on Monday. I told him I did not want it advertised on the fAA email list in case either the FAA or Sheriff changed their mind. 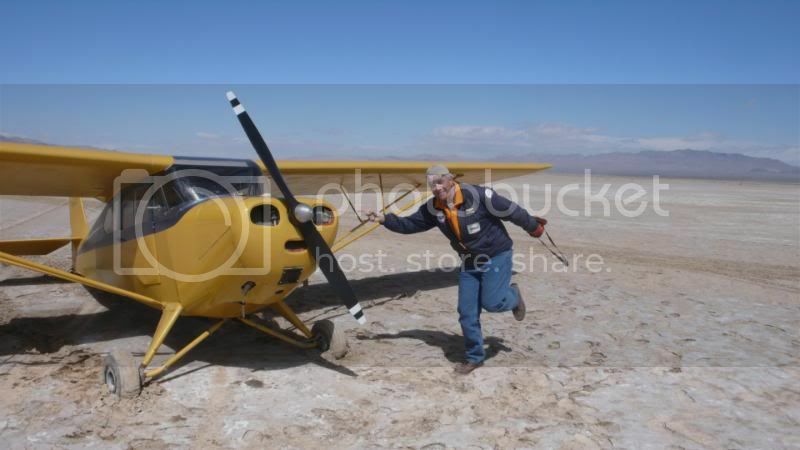 Lets get the airplane out of the desert and on a runway or hangar, THEN tell everyone that its been taken care of. Later on Monday afternoon Mike Friedrich of Casa Grande (who owns the Aeronca L-3 that won Best Warbird at the airshow last weekend) called and said that he was driving to San Diego on Tuesday. Asked him if he wanted to detour a bit and and lend a hand to John. Little did I know that we really would need three people and it was really good that Mike came along. 04:30 on Tuesday I woke up without the alarm. My feeble brain was concerned about the approaching storms and I could not sleep. Got up and checked the weather. It was fine then but forecast for gusts 15-25, not what we needed. Then the next bit of bad news popped up. There had been a fatal accident on I-10, the highway that I was going to drive to Blythe on, and it would be closed for at least three hours. Not good… Planned a new route from my house in N. Phoenix through Wickenburg, then West on highway 60 to bypass the accident. We had to go this direction anyway to pick up the 4 wheeler and its trailer, but this would cost us at least 45 minutes delay due to using back roads. Arrived at the place where the 4 wheeler was stored and 20 minutes later we were back on the road heading West. Note the difficult weather and clouds. Did not look good. Mike had headed on and was closing in on Desert Center and the turnoff road, CA-177 that would take us to the landing site area. We were about 20 minutes behind him and he started scouting things out for us. Try as he might, he could not locate the plane from the road nor several small hills around the road. We turned NE on CA-177 and started the trip as John said it was 9.9 miles on the road where he walked out of the area. 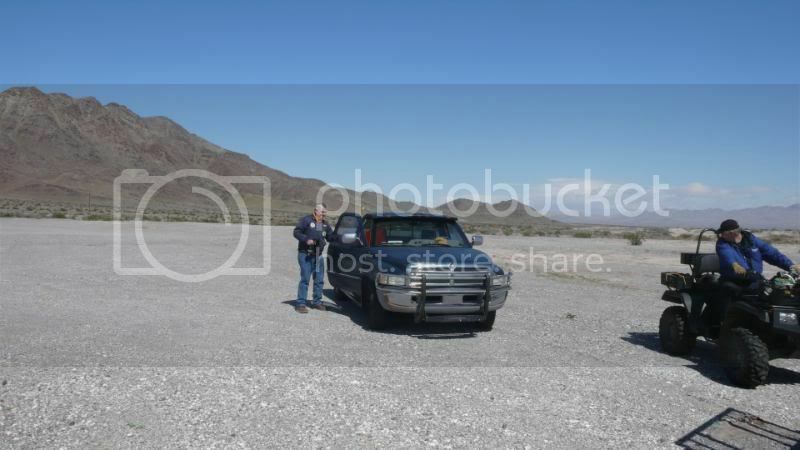 As luck would have it, just at the 9.9 mile point there was a highway department gravel storage area, which allowed us to pull both the trucks off of the road and actually drive into the desert about half a mile before the ground started to get too soft for us. We were not real comfortable leaving the trucks and trailer on the road, so this worked out very well. 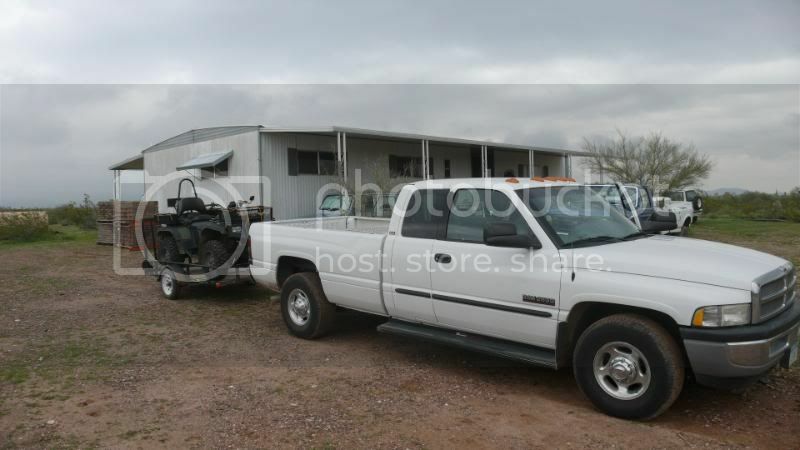 Off loaded the 4 wheeler and then got the idea to tow the trailer behind us so that it would be easier to take all three of us out to the site. Got going with Mike and I in the trailer and Grant driving. Soon we ran into very loose and fine sand and dirt mix that only the 4 wheel drive ATV with its large low pressure tires could handle. We did not get stuck but it came close a couple of times. Finally had to get Mike to ride on the back seat on the ATV to provide more traction to the drive wheels. After 20 minutes or so drive into the boonies, we still could not see anything, but there were large berms everywhere and the Chief could be behind anyone of them. Another few minutes driving and things started to open up and off in the distance we could see a shape. Finally sure its in one piece but look at the winds and dust around. Finally getting to the plane we could see right away what the problem was. First off the landing surface was way too wet and the mains were sunk up to almost their axles. 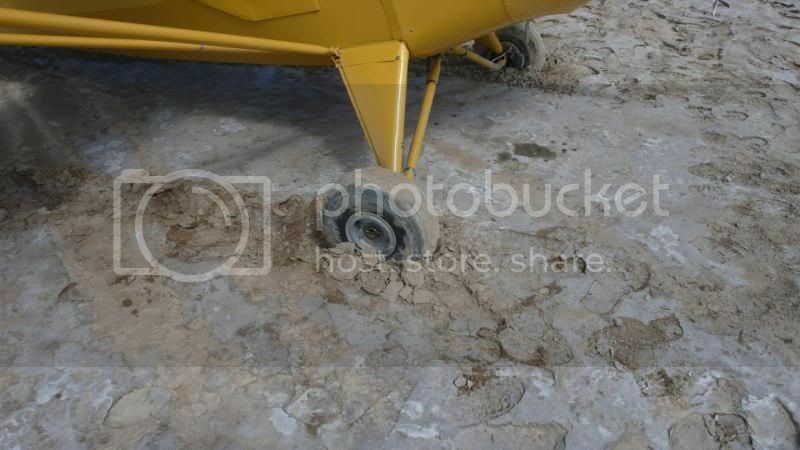 Second the big issue was the small hard rubber tailwheel that was so far into the mud that you could not even see it. 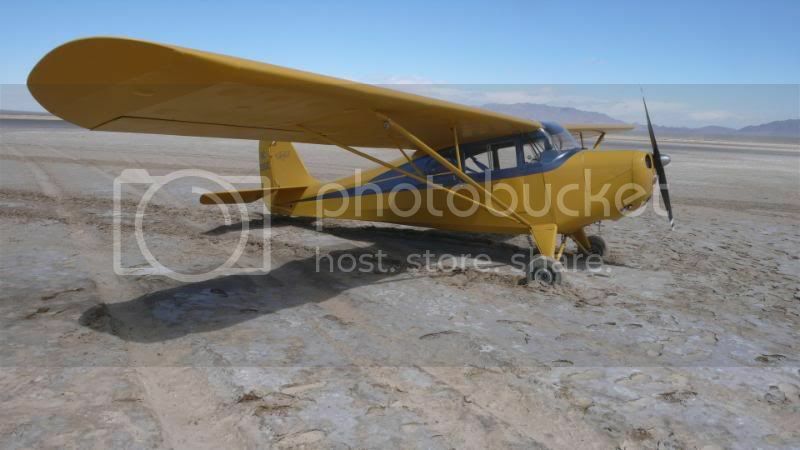 Mike and I strained to lift the tailwheel out of the mud, then Grant got it cleaned off and moved around so that it was not six inches underground. 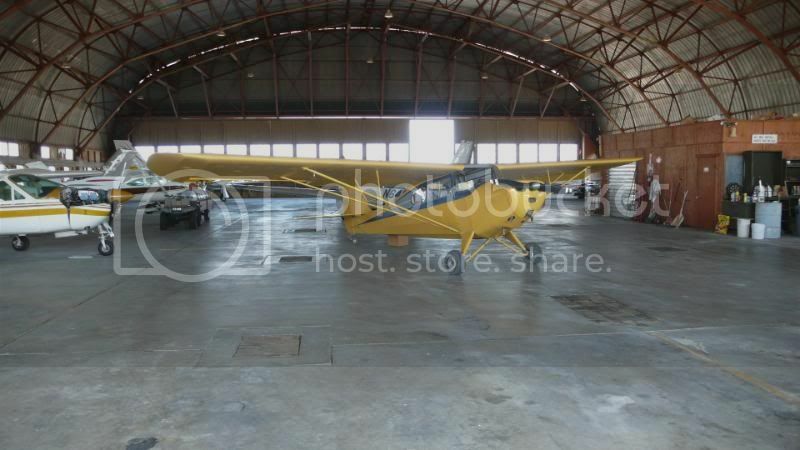 Note the tailwheel is way under the surface. No wonder that John could not taxi anywhere! Mike getting ready for this! This was after we had worked with it a bit, but the mains were still deep in the muck. It appears dry but everywhere you step its very soft right under the upper crust. 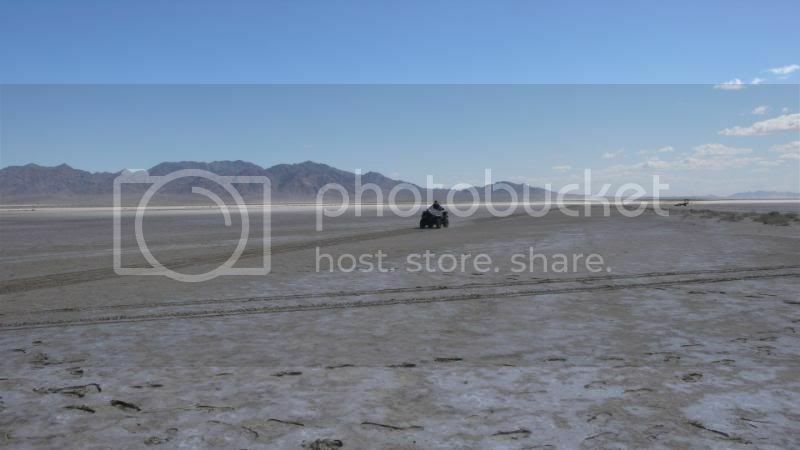 Then Grant got on the 4 wheeler and “made a runway” running up and back down the playa into the wind. He slowly increased its width then increased his speed to pack it down a bit. All the while the wind was increasing, which was both good and bad. 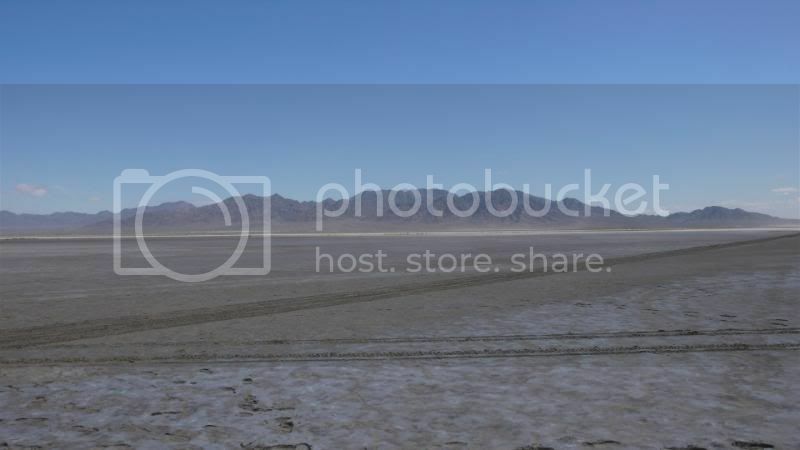 We had to get the plane off the playa before the wind made life difficult but also needed the wind to dry things down a bit before we used it. We were "inbetween a rock and hard place as it would have been impossible to take off on this surface yesterday, just too wet. Tomorrow (today) would have also been difficult as there is another front coming through and we did not want to leave the plane there another night not secured. Ready for takeoff we hope! We then hooked some tow rope that we had to the tailwheel spring and slowly put tension on the airplane with Mike and I holding the tail out of the muck. Also we had dug out the mains as best we could and flattened their path going aft. After a foot or so the airplane moved better and he moved the airplane out of its ruts. Problem was that he surface was still so soft that he could not stop or it would have sunk in a bit. He moved in a nice arc and took it back to the beginning of the new runway, staying in his tracks. We walked down to the airplane and got ready for the next stage. Did a good pre-flight on the plane and got in. Of course the cockpit was full of things, headset, radio, intercom, battery, small cooler, sleeping bag and cushion, tent and so on. It was stuffed and I am not as skinny as John is! It was a tight fit but finally got inside and belted in. Mags on, throttle forward a couple of times to prime the engine (could not find a primer!) and Mike propped it. Nothing… Second time…. Nothing. It caught on the third time and settled into a nice idle. Oil pressure came up almost immediately and we let it idle for a bit to get some temps into everything. We had briefed the takeoff and Mike and Grant were going to hold the wingtips until I got to full throttle and gave the signal to let go. Ha! That was not needed! Once warmed up a bit I ran the engine up to check the mags and carb heat, then when I was sure they were ready went up to take-off power. Gave the signal and they let go of the wingtips… Nothing happened. Slowly, really slowly the airplane started to move but the confidence factor was really not good from inside the airplane. Noticed that I was outside the “runway” tracks a bit and moved over and that helped but not a lot. Finally gave up and abandoned my “short field take off” procedure and pushed the control wheel forwards to get the tailwheel up and out of the dirt and finally we had some forward movement! A second or two later and the airplane got light and we were airborne. Wind was gusting so it was touch and go for a bit but finally got good positive rate and airspeed and finally some reasonable altitude. We do not have any photos of the takeoff, but how about a video? Mike did a very good job taking this with my blasting dust and dirt at both of them. Notice the real lack of forward motion when they let go of the wingtips! My first thought was for me to get the airplane in the air, then loiter over the area while Grant and Mike loaded things back up and got to the truck. They were concerned about the wind and told me to “forget about them, get my rear and the Chief to Blythe before the wind got even worse and get the plane safely on the ground!” They would worry about themselves and if needed would hike out like John had done. 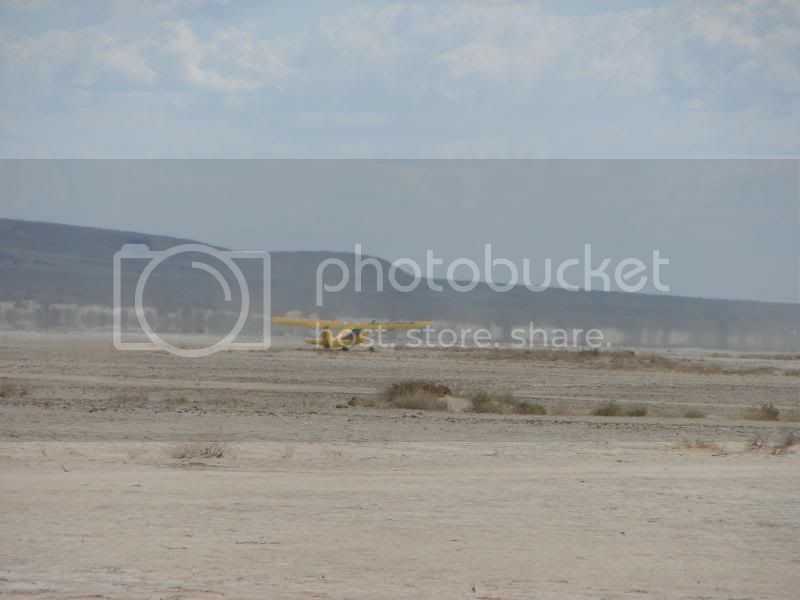 I flew the plane to Blythe and landed there (even made the first turnoff but a 20 knot wind helps!) just after 1 PM. Funny thing was that after landing was taxi’ing into the ramp area and saw a Culver Cadet that was at Casa Grande. The pilot was really giving me the once over and I waved at him. Once the Chief was tied down walked over and it was Carl Walston, a good friend of John Rodkeys back at home. He was looking and looking at me, thinking that I did not look at all like John Rodkey and why was I flying John’s airplane! He could not believe the story and bet he and John will have a lot of “hangar flying” to talk over once John gets home. The Chief is now safely sitting in the hangar at the FBO in Blythe. Most all of the expensive stuff has been taken out of the airplane and stored in a box in the managers office at the FBO, including the food that John left in the airplane! ##$>%%^& John!!! Next time you leave an airplane anywhere out in the boonies, please take ANY food out of the plane. Had critters gotten to it and been hungry, it very well might have looked like the Piper Cub in Alaska we have all seen photos of on the internet. The rest of the landing and so on you did a very good job and having a plane to fly out the next day is proof of that. All ended well and John is supposed to be coming to Blythe this weekend to fly the plane back home. All three of us were bushed (the drive alone was over 500 miles) and the bed felt very good last night. Now for a shower and get all the dust and dirt out of everywhere! PS, I have to add. A group of very nice people on this board did a very wonderful thing and helped me out when Brian Safran posted about my situation on tires for the Sedan. They helped me, and the three of us just helped John. Pass it around and help someone when they need it. Hopefully it will come full circle and back to you when you need it the most. What a great story and testimony to the dedication of you all! Man what an adventure! Glad everything turned out so well. It's great having friends step in and go beyond the call of duty to help. BobK wrote: In a word, BUSHWHEELS! Bushwheels would have helped a lot but the big thing that kept him from moving was the small hard tailwheel. It really dug into the mud and we were looking at having to make a ersatz tailwheel skid to get it out, but were able to get by without it. That was a great act of kindness! You guys saved that plane. Traveling the distance you did and getting that plane out is way above and beyond! Great job!!! and interesting photos and video. You are the best! This is why I like hanging around airplane people. I am glad you where successful. We Are from the fAA, and we are here to help you !! !